Well, it’s been a couple of days, I thought that I should post a new screenshot. There’s a bunch of new cool stuff here, but it’s kind of subtle. 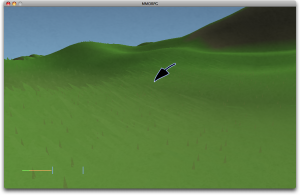 I’m much happier with the 3D cursor now (although it still needs a little more work, and I’d really like to cast a shadow from it to really show where it is in the world..); its behaviour is much nicer and snappier, and not nearly as glitchy as it was before. I’ve made some subtle changes to the brush on the ground which makes the effect visible from a much longer distance, and also makes it look better in general (I think). And best of all, like in the last image, I’m here pointing at the boundary between two zones. There’s no longer a discontinuity at the border between zones, as there was in all previous screenshots! Yay! I think the next step is going to be adding a simple 2D UI with buttons that can be clicked on, and then.. I’m not sure what next. Maybe roads. Maybe bridges. Maybe buildings. We’ll see how I’m feeling when I get there. 2 June, 2009 in Full Games, MMORPG Tycoon.